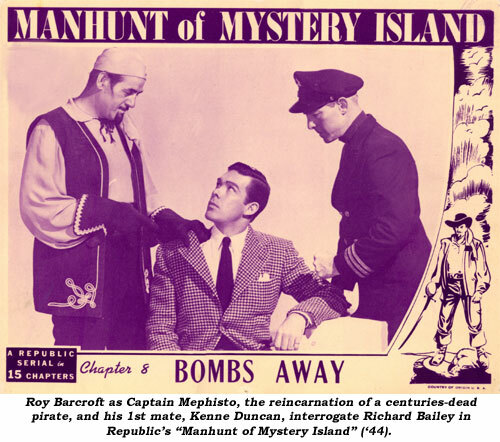 Serial Report Chapter 49-Roy Barcroft, Manhunt of Mystery Island, George Wallace, masked villians. Trying to imagine Republic’s contribution to serial making without the participation of Roy Barcroft is akin to imagining “HighNoon” without Gary Cooper, Laurel and Hardy minus Hardy or a big spaghetti dinner sans a good red wine. 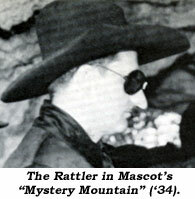 Barcroft figured in dozens of the studio’s cliffhangers—not to mention appearing in a myriad of westerns and other B-features—and it’s impossible to overestimate his influence on these. Every serial he appeared in was better off for his participation and none the worse for it. His most colorful role of villainy was probably the title creature from “The Purple Monster Strikes”,but nearly as memorable was the part of Captain Mephisto from Republic’s 1945 “Manhunt of Mystery Island”, a particular favorite of mine due to its boldly exaggerated premise and Barcroft’s bigger than life performance. It took six studio writers, Albert DeMond, Basil Dickey, Jesse Duffy, Alan James, Grant Nelson and Joseph Poland, to come up with the plot, which, in all fairness, lifts a lot of ingredients from “Mysterious Dr. Satan” (including the main Copperhead musical cues and the last chapter switcheroo which I won’t give away), but which also delivers a lot of new outrageous wrinkles. 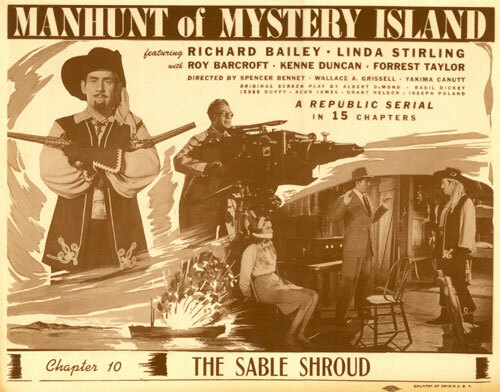 The plot follows Linda Stirling as Claire, a young woman searching for the whereabouts of her father (Forrest Taylor), a world famous scientist and inventor of a new power transmitter who has recently disappeared somewhere on an obscure place called Mystery Island. Enlisting the aid of famed criminologist Lance Reardon (Richard Bailey), the two journey to the remote site where they meet four descendents of a long dead pirate by the name of Capt. Mephisto. Amazingly, one of these four, using a device called a Transformation Chair, has devised a way to turn himself into a kind of reincarnated form of the Captain. (Your suspects are Ed Cassidy, Harry Strang, Forbes Murray and Jack Ingram.) In this guise he has kidnapped Claire’s father in an attempt to gain the secret of the transmitter and, with the assistance of a gang of henchmen, begins the process of eliminating his descendents with only Reardon to stand in his way. The cliffhangers are lots of fun (even if at one point there is a gigantic cheat as far as Bailey escaping a stabbing) and the miniature work of the Brothers Lydecker shines with a wide array of exploding cars, boats and buildings. Because of the island setting, there’s more outdoor shooting than in most serials, with portions of the rocky California coast effectively doubling for the island setting. Richard Bailey as Lance Reardon comes off a bit stiff for my tastes (not to mention dressing like a racetrack tout) and I can never quite buy him as a powerful adversary for Mephisto.There’s a certain upper crust attitude inherent in his voice and mannerisms that suggests he’d be better suited chasing a polo ball than crooks. Beautiful and stylish Linda Stirling has one of her less colorful roles here, but still manages to save Bailey’s skin so often you almost begin to wonder why she needs him at all. The supporting cast is solid and headed by Kenne Duncan (inexplicably decked out like a weekend yachtsman), Jack Ingram, Si Jenks, Lane Chandler and, when not doing stunt work, Dale Van Sickel, Tom Steele and Duke Green. The combined directorial talents of Spencer Bennet, Wallace Grissell and the great stuntman Yakima Canutt (who stages some great brawls), keep things so lively and exciting you never really have a chance to question all the silliness—even for a serial—because you’re so caught up in all the non-stop action. This might not be considered one of the greatest serials of all time, but for my money it’s still a hell of a celluloid ride, one I bet I’ll take again one of these days. In Ch. 14 of “Manhunt of Mystery Island”, Linda Stirling’s airplane is sent into a dive via remote control by Capt. Mephisto and audibly crashes into a mountain. In Ch. 15, the plane barely scrapes treetops on the mountain and there is no audible crash. 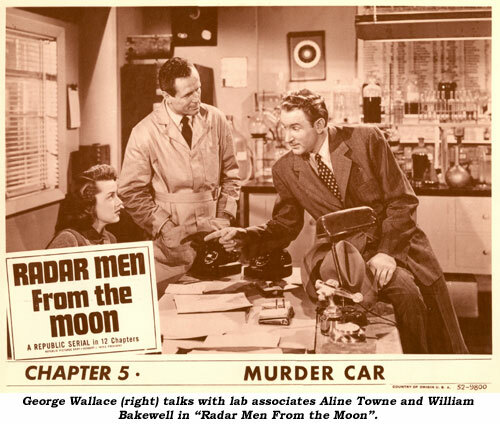 When George “Commando Cody” Wallace was called into Republic to audition for a role in the serial “Radar Men From the Moon” he didn’t realize he was about to step into serial history. George Dewey Wallace, named for his great-great grand-father, Admiral George Dewey, was born June 8, 1917, in New York City, and raised in Wheeling, a coal mining town in West Virginia. George served in the Navy during World War II and afterwards landed in southern California where he worked in a number of different jobs before becoming a laborer at Metro Goldwyn Mayer. “I was what they called a greensman,” he explained. “You build trees for a set and bring in hedges, bushes and plants.” In that capacity George worked on such features as “Sea of Grass”, “The Kissing Bandit” and “Green Dolphin Street”. 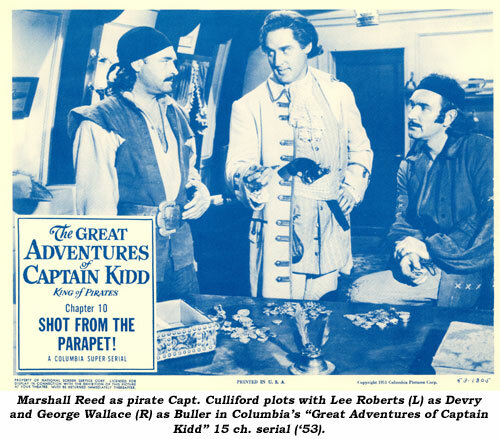 Another serial George worked in was for Sam Katzman, Columbia’s “Great Adventures of Captain Kidd” with John Crawford as Captain Kidd and George as his aide. Several pirates were played by old-time wrestlers such as Mr. Moto and Killer Karl Davis. “They put wigs and earrings on them to make them look like pirates,” George laughed. Although George received the role of Commando Cody in “Radar Men From the Moon” instead of the smaller part as a heavy, in looking over his varied career he told us he enjoyed the heavies he played. “You could bring so much to the heavy. You can bring a limp, you can bring one eye, you can sneer and do a lot of things instead of being the straight leading man. I’m very lucky because in films and TV in the early days I was always the heavy, but on Broadway I was the leading man. Now, as time went on in my older years, I became the judges. I had a series at Paramount called ‘Sons and Daughters’ with Lucy Arnaz and Don Murray, which, unfortunately, didn’t go too well. I played Grandpa Hank in that one. We were pre-empted so many times, three times with the Gulf War; once with George Burns’ birthday party; another time for the Miss America Pageant; so it just went down the tubes. George’s acting career continued, appearing in such films as “Forbidden Planet”, “Vigilante Terror”, “Big Sky”, “Drums Across the River”, “Lawless Breed”, “Destry”, “Six Black Horses”, “Caprice”, “The Stunt Man”, “Punchline”, “Bicentennial Man” and “Minority Report”, as well as countless TV shows: “Gunsmoke”, “China Smith”, “Zane Grey Theatre”, “Wyatt Earp” (as Frank McLaury), “Dynasty”, “X-Files”, “Joan of Arcadia”, etc. ; Broadway plays (“Company”, “Pajama Game”, “New Girl in Town”, “Jennie”); and with National Touring Companies (“Camelot”, “Kiss Me Kate”). George Wallace had a terrific and varied career—and it all started with a Republic serial! 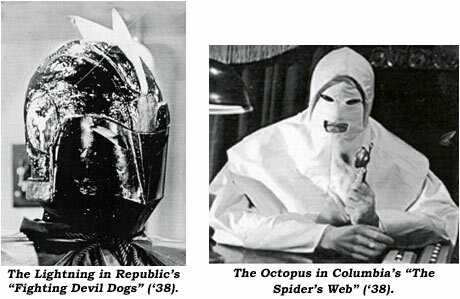 Almost all serials were fun to watch, but those that featured a masked hero or villain were particularly entertaining. What difference did it really make if the studios cheated outrageously by having several different people wear a particular mask during the length of a complete serial. We knew who was really under there anyway, didn’t we? You couldn’t fool us in a million years. The clues were always so obvious. Well, not really. Unless all the suspects were killed off one by one, you really didn’t have a chance at all to guess who the real villains were. Of course, if you saw a Kenneth MacDonald, Stan Jolley, Forrest Taylor or their like creeping around, you were pretty sure they were under those masks. But, then, you’d be wrong a lot of times. Having a hero or villain wear a mask was a boon to the director who could place any available stuntman in the various outfits to do action scenes. 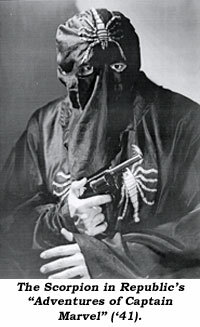 I’m always asked who my favorite masked villain is and I have to say that it is The Scorpion from “Adventures of Captain Marvel”. It’s really a nostalgic choice more than anything else. That was the first complete serial I saw as a kid. Who knew Gerald Mohr’s voice was dubbed in as a studio “cheat”? Who cared? The fact The Scorpion could melt mountains with his deadly Golden Scorpion was enough to keep my juices flowing. The wonderful thing for kids concerning western serials was that it gave them a chance to see one of their favorite stars in action for 12, 13 or 15 weeks instead of the customary 3 or 4 times a year. In many cities, even though a star may have made a series of eight titles a year, matinee theatres only played half or less of that output. The smaller theatres down South were the lucky ones who got to show virtually every title put out. The western serials were also a great boon to producers. Here was a chance to shoot most of their titles at local ranches or locations like Iverson’s without having to build the costly interior sets many of the non-western titles required. It also gave them a chance to utilize a large amount of stock footage they had built up over the years that was shot for silent movies. One only has to look at a few of Universal’s serials to see the same Indians being shot from their horses; the same wagons going over the cliffs and the same good-guy, bad-guy chases being re-used time and time again. Still, the action was usually fast and furious and what did we kids know or care about how the producers were saving money. Just give us our heroes making mincemeat of the badguys. Tom Steele’s voice as “The Masked Marvel” was dubbed in by actor Gayne Whitman who played “Chandu the Magician” on the Mutual Don-Lee network from 1932-1935. Whitman was the announcer on many radio programs such as “Cavalcade of America” and “The Telephone Hour”. Whitman is seen in two Universal serials: “Finger Prints” (‘31) and “Heroes of the Flames” (‘31).